Columbus DeLuxe is a slot for which you won't need a manual to start playing. That is to say, there are no unusual features what so ever in this slot; an absolute shame since the topic of the slot is an explorer. The standard symbols ten until Ace have been used, and Columbus himself is the wild. He can replace all other symbols on the reels, except the ships that pass on the reels from time to time. There are three of these ships, and together they form the scatter. You can keep the sound on in this slot since it supports the game, but it's likely you will eventually want to turn off the sound. However, you won't find a mute button in this slot. Novomatic really should have paid more attention to this aspect of the slot, and this is not up to standards. 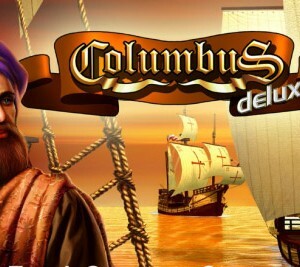 Columbus DeLuxe is a slot by Novomatic in which the famous explorer has the leading role. So, not very surprising that it’s a theme with a lot of sea since that’s where Columbus spent most of his time. 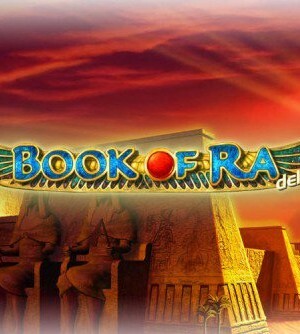 It’s slightly disappointing that this slot does not contain a bonus game, but the pain is lessened by the free spins and the wild symbol this slot does feature. Besides this, the slot includes a gamble feature, allowing you to continue playing with recent wins to win even more. How to play Columbus Deluxe? Columbus DeLuxe is a slot for which you won’t need a manual to start playing. That is to say, there are no unusual features what so ever in this slot; an absolute shame since the topic of the slot is an explorer. The standard symbols ten until Ace have been used, and Columbus himself is the wild. He can replace all other symbols on the reels, except the ships that pass on the reels from time to time. There are three of these ships, and together they form the scatter. You can keep the sound on in this slot since it supports the game, but it’s likely you will eventually want to turn off the sound. However, you won’t find a mute button in this slot. Novomatic really should have paid more attention to this aspect of the slot, and this is not up to standards. Columbus DeLuxe is equipped with free spins. In most slots, these are the highlight of the slot, and the Columbus DeLuxe slot is no exception. An extra symbol is chosen to function as the wild, which causes wins to increase even more! 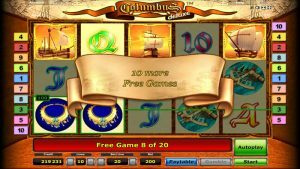 Columbus, of course, remains a wild symbol throughout the free spins. 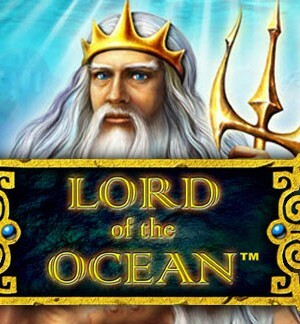 Furthermore, if you land another three ships on your reels during the free spins, you will win extra free spins that will be added to the free spins you have remaining. Notice that the ships during the free spins have a different color than during the base game. When you land the scatter three times, you will receive 10 free spins. This isn’t a lot, so it’s nice you can win extra. There is no multiplier active during the free spins; you’ll have to make do with the extra wild, cause that’s all there is. Columbus DeLuxe has a small number of pay lines, as you might expect from this developer. There are only ten pay lines, and you can only adjust these down by clicking the buttons alongside the number of pay lines. To the left of this option, you can activate the autoplay. There are two modes for this autospin, ‘on’ and ‘off.’ These are the only options. When you have the autospin turned on, you cannot use the gamble function. You can find this to the left of the spin button. This function enables you to continue gambling with the wins on your reels after the last spin. If you win, you can continue playing, or you can choose to take out your wins and return to the base game. 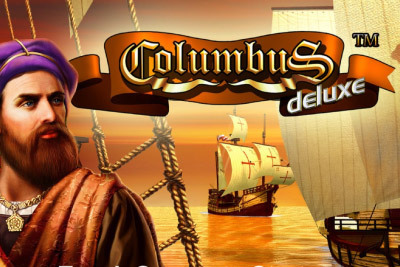 Columbus DeLuxe is a scabby slot, but perfectly suitable for gamblers looking for a simple video slot.